Sophomore Grace Bond follows her tee shot, as Xenia teammate Brynna Mardis looks on, during Wednesday’s Sept. 5 girls high school golf team match against Alter at WGC Golf Course in Xenia. The match marked Xenia High’s first home match in at least seven years. Xenia High freshman Brynna Mardis follows through on a tee shot as Alter players Fiona Hoskins and Maggie Pascual look on, Sept.5 at WGC Golf Course in Xenia. Coach Kent Anderson appears startled as Xenia golfer Stacie Baxley (far left), and teammates Gillian Miller, Brynna Mardis, Grace Bond and Eliana Berryman share a laugh after the girls high school golf match against Alter, Sept. 5 at WGC Golf Course in Xenia. 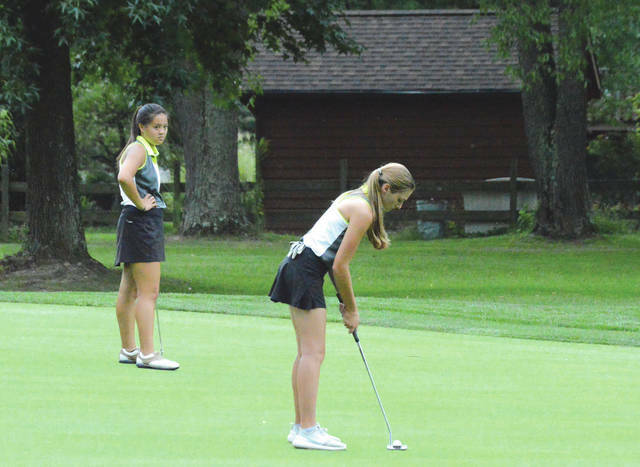 Alter’s Maggie Pascual (left) watches teammate Fiona Hoskins putt during a girls high school golf team match Sept. 5 at WGC Golf Course in Xenia. Pascual claimed medalist honors and Alter won, 185-236, in Xenia’s first home match since 2011. 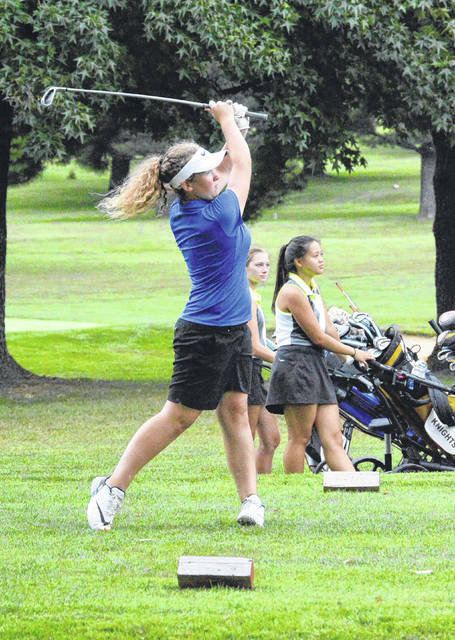 XENIA — A bit of history was made Sept. 5 on the back nine holes of WGC Golf Course: a Xenia High School girls golf team hosted a dual match. 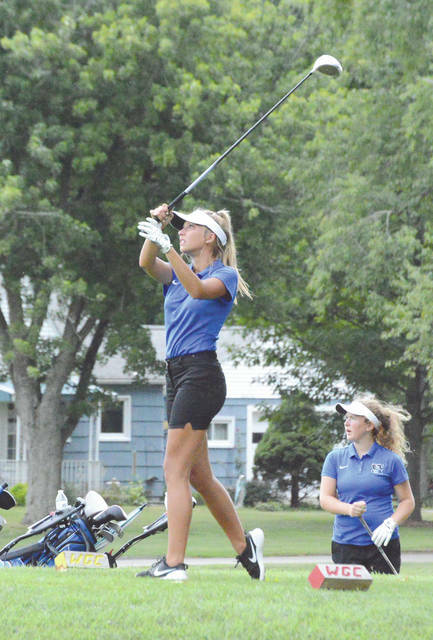 According to XHS girls coach Kent Anderson, it’s believed that Wednesday’s 185-236 loss to visiting Alter marks the first time since 2011 that Xenia had hosted a girls golf match. There was a Buccaneers girls golf team in 2012, but it’s believed that they did not host a match. This is the first year since 2012 that Xenia High has fielded a girls team. Anderson motioned over to a smiling sophomore, Grace Bond, who had just finished her round of golf with freshman teammate Brynna Mardis. Bond said the transition from playing on the boys team last season to being part of the girls team this fall has been very enjoyable. The team lost its top golfer, Olivia Wagner, just the day before. The 2017 district qualifier had shoulder surgery with Cincinnati Reds doctor Timothy Kremchek to repair a fastpitch softball injury and is gone for the season. That’s pushed Mardis and Bond up to the nos. 1 and 2 spots in the Xenia lineup respectively. “I think we all know that we have to step up. It will be hard to play without Olivia, though. She’s awesome!” Bond said. “Yeah, we know that we’ll be playing against some really good competition. We’re just out here working on our games and having fun,” added Mardis. Mardis led the Buccaneers with a round of 48, second only to Alter medalist Maggie Pascual who finished with a 44. Other scores for Xenia were turned in by Bond (56), Stacie Baxley (a career-best 63), Gillian Miller (69) and Eliana Berryman (72). Alter coach Katie Ellis was impressed with how the youthful Bucs played. Anderson said the team had improved its score by 36 strokes from when it last played a match. 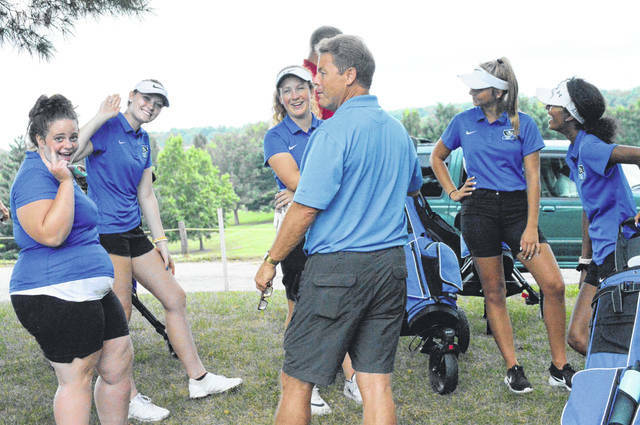 The veteran boys basketball coach knows all too well that the girls golf team is a fledgling program, and so he’s being very patient with his golfers. Unless rain spoils things, more fun could be had starting at 5 p.m. on Thursday, Sept. 6. The girls team will host West Carrollton at WGC then. The Xenia boys golf team also has a home match at WGC on Thursday. They host Fairborn at 4 p.m.